Over the last 40 years, middle and lower income earners have seen their wages drop relative to rising costs of living, while an ever-increasing percentage of their labor is paid at the top. 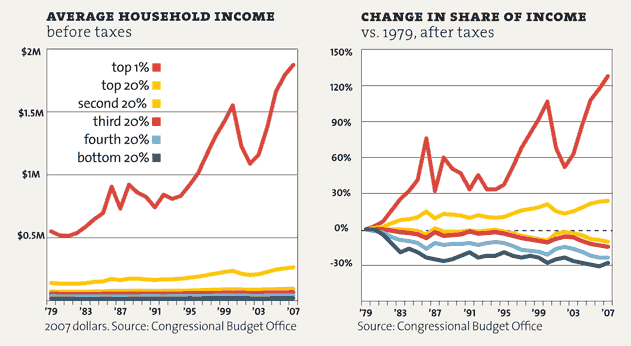 The disparity in income tax payments largely reflects the disparity in income itself. As put by entrepreneur Nick Hanauer, if the median had risen accordingly, it would be $90K/year (as opposed to $50K/year). 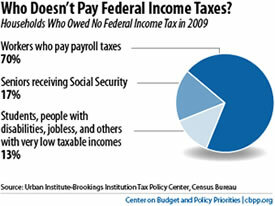 The federal income tax burden would be shared more evenly as well. So where has this loss in income gone? At the top of course! 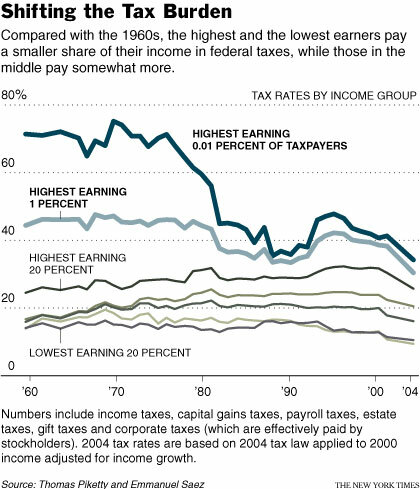 Higher income earners pay a higher portion of the taxes because they make a higher portion of the overall income. And while this has always been the case, and no doubt essential for a market economy, it’s the rate at which this disparity has grown that many find as striking. 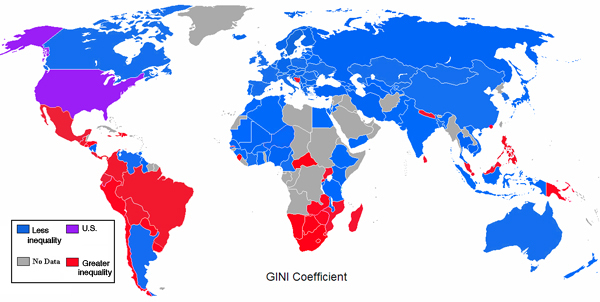 In fact, the US now has the highest inequality of all advanced nations, and actually rivals some developing nations. 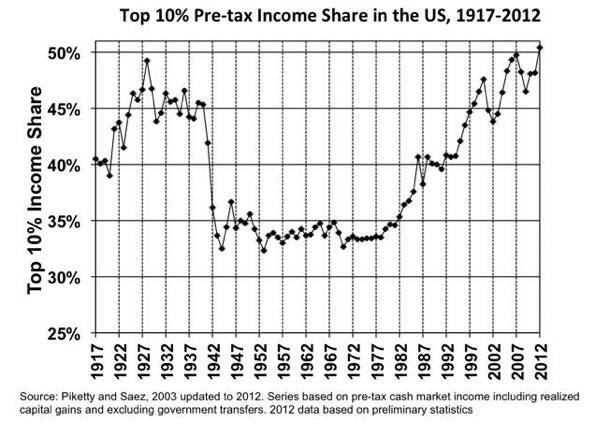 It’s important to note that this growing disparity correlates with a move towards the very policies favored by those who believe the rich pay a disproportionate percentage of the tax. 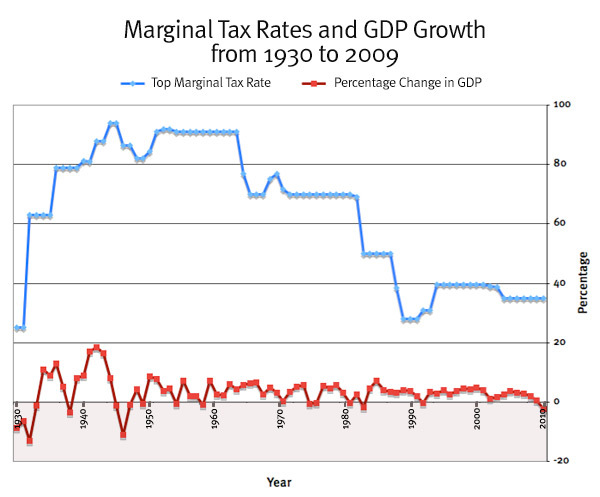 Tax rates (even federal income taxes) on the wealthy are actually much lower than they were 40 years ago. Unions, no longer protected as they once were, have been dismantled. The rationale behind this? 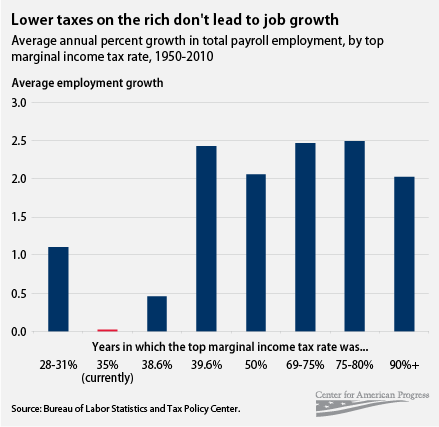 These tax cuts would trickle down to the middle/lower income earners and create more jobs. 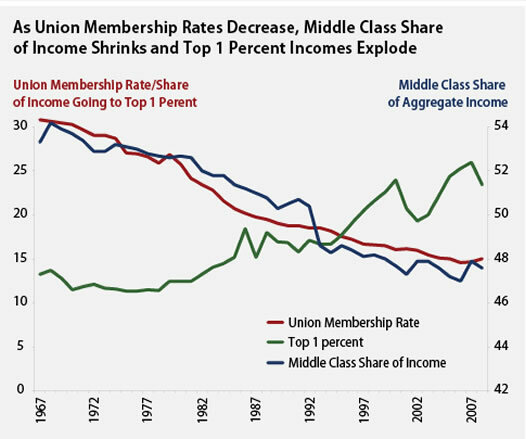 Dismantled unions would free up job creators and let the market create jobs. But none of this has manifested. Job creation has actually been slower during the “low tax” years. GDP hasn’t grown any faster. 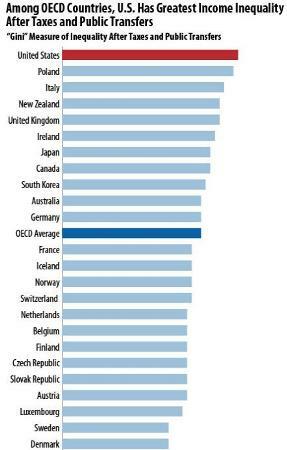 And the US has not only the greatest income disparity across industrialized nations, it also lags in upward income mobility. But that top 40% group includes single people with incomes as low as $51,100 and couples with incomes of $72,300. Those people aren’t poor but it’s a real stretch to say they’re rich. 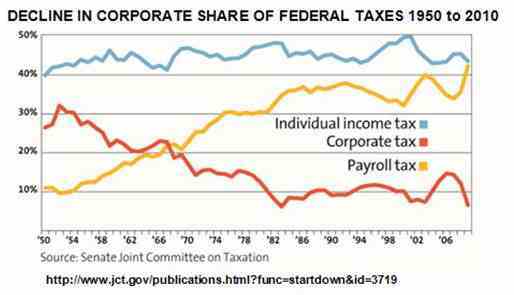 The federal income tax rate is the usual whipping boy for those who proclaim that the rich are over taxed, and that their wealth is merely distributed down to (implied lazy) lower income earners. However, even lower income earners have to pay payroll taxes (at a higher rate than higher income earners), and local/state taxes. What’s more, is that the actual wealthy make their money from capital gains (which are taxed at a much lower rate), not from standard income. What’s more is that real investment didn’t grow any faster with the reduction in this tax rate (the usual justification for this tax cut). When you hear Warren Buffett make the claim that his tax rate is lower than his secretary’s, he is right. Like many other billionaires, his income comes from capital gains, not a salary. 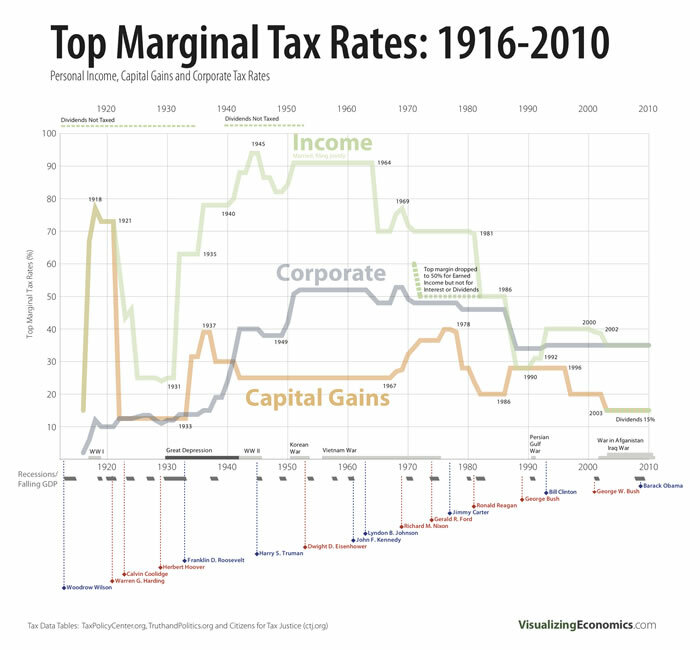 The top tax rate for capital gains is 20%, which is much lower than the federal tax rate for middle income earners. As of 2014, the payroll tax encompasses a flat 2.9% for Medicare/Medicaid (regardless of income) and 12.4% for the first $117,000 for Social Security, after which, no SS tax is applied. In other words, someone making $40K/year pays the same rate (for Medicare/Medicaid) as someone making $400K/year. On the Social Security side, someone making $40K/year pays a HIGHER rate of their income than someone making $400K/year (because only the first 29% ($117K) of the latter’s income is subject to this tax). It’s important to note that Payroll taxes continue to play a larger and larger role of the overall budget (meaning middle and lower income earners are actually taking on a larger percentage of the overall tax burden). One of the common objections to using the payroll tax as an indicator of tax burden is that employers take on half of that tax burden. While technically true, it’s generally agreed upon that this burden is generally shifted toward lower income earners by way of lower wages. Another common objection to use of the payroll tax as an example of lower income earners paying taxes is that it’s not really a tax, because lower income earners benefit the most from it in terms of later-in-life benefits. While this is largely true (as they are more likely to need it later in life) it’s also true that lifespans for lower income earners are on average, much shorter (meaning they are actually less likely to see that money). What’s more, is that these payroll taxes are what fun the bulk of the social safety net, which the “taxes are too high on the rich” crowd incorrectly cites as “wealth redistribution.” This is false, because lower earners DO pay into this pot, at a higher rate. They are paying into this pot—it’s not a “gift” from higher income earners.